Apparently, a dog isn't just man's best friend. They can be a cat's best friend too. 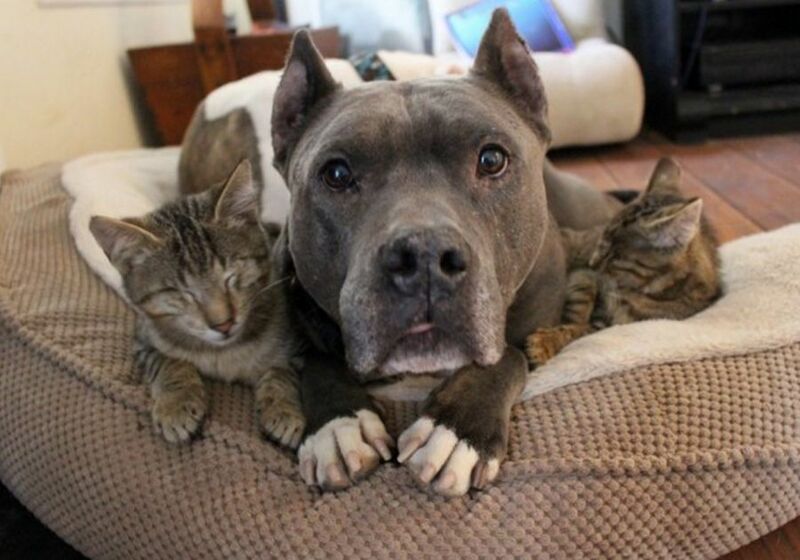 Cats Helen, 7, and Bruce and Willis, 10-weeks, were under the care of the Faithful Friends Animal Society when circumstances required that they all needed to have their eyes removed. "Helen had severe glaucoma. Her eyes were bulging, causing her pain and affecting her balance. Bruce and Willis' eyes were ulcerated, protruding and infected," according to the Huffington Post. Doctors determined they needed their eyes removed to ensure they were comfortable and healthy. Initially, the cats struggled wth living without their vision, so Sherry Stewart, a volunteer at the shelter, brought them home to foster them until they were ready for adoption. The cats were not her first pets. Stewart has fostered more than 80 pets including two pit bulls, Frankie and Alfie, both of whom she later adopted. Both dogs have proven integral in the cats' adjusting to living blind. 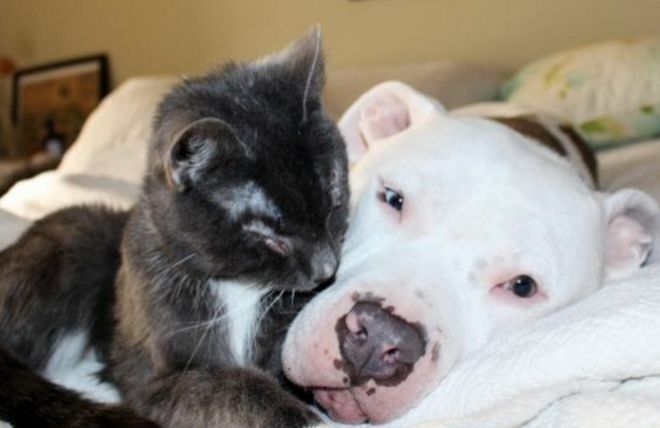 Stewart adopted Alfie after he was brought into the shelter in such bad condition, that he was scheduled to be euthanized. A victim of animal cruelty himself, Alfie, the gray one, has healed well enough to become a certified pet therapy dog. Frankie is also affectionate, though perhaps a little over eager, Stewart told the Huffington Post. "They kind of act like surrogate moms. They seemed to have sensed they need a little extra TLC," Stweart told The Huffington Post. 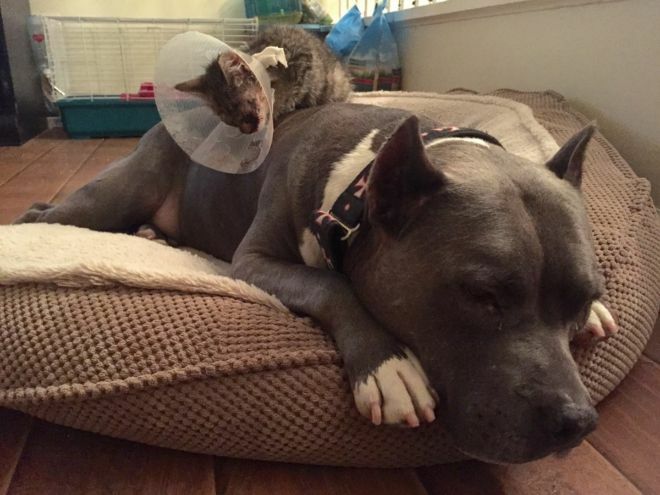 Thanks to the loving attention from the dogs, the cats have made significant progress. Bruce, the smaller kitten, even naps on top of Alfie. Helen, the adult cat, adjusted well and even learned to navigate stairs. She was eventually adopted. Bruce and Willis, both playful kittens, must be adopted as a pair because of their traumatic backgrounds. Alfie and Frankie certainly embody the "nanny dog" reputation. If you loved their story, be sure to SHARE it with your friends!